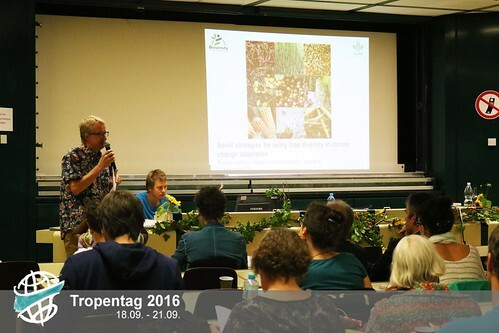 Senior Lecturer from the Botswana University of Agriculture and Natural Resources (BUAN), Dr Joyce Lepetu shared her view on tropical forestry in regard to solidarity and fair use of natural resources, main theme of Tropentag 2016. Do you know what rice consumption in Nigeria and milk consumption in Kenya have in common? It’s something that both livestock and crop farmers, especially in developing countries, have to deal with: the risk of exposure to mycotoxins in food. 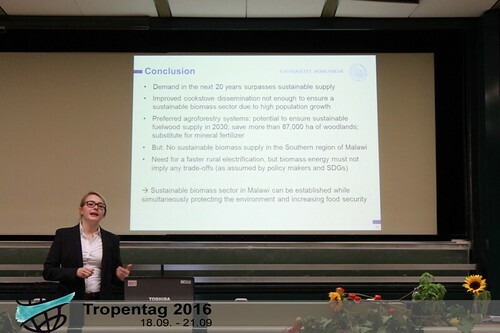 One could hear about this topic today, last day of Tropentag 2016, in the fourth oral presentation about food security and nutrition, as well as yesterday in the third poster session about mobile dryland pastoralism. I had the chance to hear both Olusegun O. Atanda’s and Caroline Makau’s research results about such an issue on food safety, which is considered as a specific problem of tropical regions. Exposure to mycotoxins, in fact, should be as low as possible since these are genotoxic and carcinogenic. In Kenya, aflatoxins (a type of mycotoxin produced by Aspergillus, a species of fungus) pose a safety risk in cow milk. Research revealed that this resulted from poor feed storage and on field infestation during plant growth, which then contaminated animal feeds and finally ended up in the milk. Caroline Makau stated that especially rotten maize cobs used as ingredients in on-farm formulated feeds caused this problem, and that contamination was especially high in peri-urban farms. Olusegun Atanda’s study is mainly a call for doing more large-scale research and for stressing the need to continually monitor mycotoxin levels in rice. As it seems, this subject is worth being followed in the future. Fertilizer or cash? What is the best subsidy and for whom is it? Why farmers prefer fertilizer over cash? Who are the farmers going for fertilizer, who the ones going for cash? 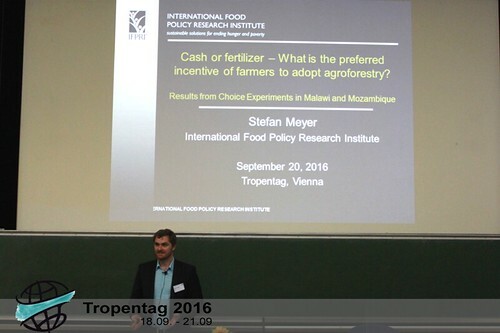 The study used different sets of choices as possible options to be picked by the farmers. Set A, for example, offered the possibility to choose either 50 dollars or 100kg fertilizer. The study interviewed 808 households and led to results showing that, in most cases, one's preference would always anyway go for a subsidy, no matter in what form. And still, the farmer would rather opt for cash depending on the expenses he has. Namely, school fees for children, health insurance, rent. One of the proposed conclusions on the solutions that may improve the support given to farmers focused on the distribution of fertilizer as a subsidy instead of mere money. In the long-term, this could in fact increase the benefits resulting from its usage. At the moment, there are 11 seed banks in developing countries, and they are coordinated by CGIAR centres around the world. Nevertheless, farmers are often still far away from breeding progresses and have no access to diverse, locally adapted seeds. Building up a community driven, decentralized seed banks should be a one of the main priority in future development work. Bioversity International tries to use crop genetic diversity to face rural challenges and foster adaptation to climate change. This is why a handbook, a resource box for resilient seed systems was compiled in order to assist scientists, plant breeders, farmers and the practitioners in the field. About 150 different stakeholders coming either from the research field or from farms in several countries have worked on this handbook for 3 years..
Delivering wind energy to small-scale farmers in Argentina: why did it fail? Background: in Argentina many areas do not have access to electricity and people are typically practising wood spinning as daily livelihood, apart from farming. In those houses, an EVOLUX G2 500 watt (at 12m/s) electricity plug and light system was installed. In one of these researched areas, 80% of the systems were not running anymore. -Broken blades due to the very strong local wind: an inadequate system for this area. -It was not possible to repair the systems. Spare parts were far away located, young people moved to the cities leading to a lack of knowledge for maintaining and repairing the systems. -Forbidden maintenance the systems. Farmers as end-users but not as owners. -Fund of the project did not reach the farmers and the study site. Furthermore, equipment was stolen by farmers who pretended to be government officials. Malawi in the future: will people be able to keep cooking? The impressive presentation tackles the topic of biomass demand in the future and the problem of a possible supply-gap of biomass for cooking. The main driving force of an increasing demand was identified to be the strong population growth in Malawi. Through modeling the demand and supply for the future, a big gap between the two was found, threatening the biomass availability. Even though other (not yet used) sources like crop residues may be used in the future, the demand will still exceed the supply up to a very high extent. What is the government doing? Is it enough to ensure enough fuel for the Malawian people in the future? The answer, given by the research, is that the planned methods will not be sufficient. The main strategy is the provision of efficient cooking stows to decrease the amount of fuel needed for cooking. The different models, with an optimistic and pessimistic scenarios, showed that, even with a high acceptance of the cooking stows, the supply gap remains. Despite this finding, the research went further and provided a solution: different, individualizable agroforestry systems to include woody biomass in the farms to increase the fuelwood supply. Do you also get this uneasy feeling when participants from all institutions are always sharing one common opinion, one not really pronounced vision? It´s not that I would mind if we were all working together to achieve all sustainable development goals, a common vision. But this is obviously not the case! 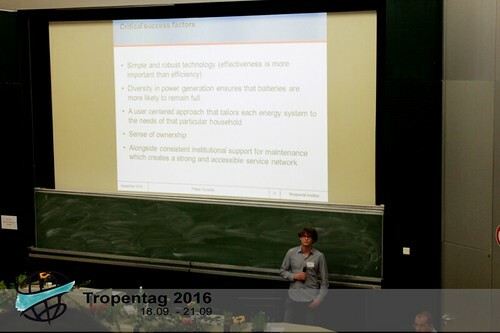 There were some first signs of the diverging notions of sustainable development on Monday's keynote. Someone asked: „So why are there still poor people getting poorer?“ (See Elsby´s blog entry on it here: http://blog.tropentag.de/node/495). Sustainability is a very broad term, comprising also many contradictory opinions on how to reach the goal. Are primed seeds or rather commonly owned landraces the answer to food security? Is it really food security or rather food sovereignty that counts? What is our vision really about? Don’t we need to ask more fundamentally critical questions: which economic system will allow a world of equality, sustainability, and solidarity? And are systems going to be the solution anyway? Once again, if anyone happened to have missed Monday's Keynote speeches from David Molden (Sharing Hindu Kush Himalayan Resources in a Changing World), Poonpipope Kasemsap (Solidarity in a Competing World and Food Security Challenge), and Ann Tutwiler (The Growing Importance of Equity and Fairness using Agrobiodiversity to meet SDGs), please take a look at the professional coverage of the presentations on youtube!